Career of a pharmacy technician has become popular in recent years, and with the projected growth of demand for these professionals, the future looks bright for you. One indeed doesn’t have to spend seven years (and a small fortune) studying pharmacy, to get involved in this fascinating field. You can get a PT certificate in less than a year, and start working in the pharmacy. In some countries and states, the certificate isn’t even necessary, and a high school diploma will suffice. 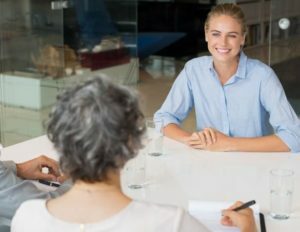 There is just one tough obstacle you have to overcome: the job interview. We will have a look at some personal and behavioral questions you will deal with when meeting the pharmacy manager, and we will advice you on how to handle the questions. Let’s start! Why do you want to work in this particular pharmacy? Do you plan to pursue a career of a pharmacist later on? Give an example of a time when you were overwhelmed with work. How did you handle it? You cannot read the prescription. What would you do? The key is to show some enthusiasm in your answer, to not sound bitter. While it is true that many people pursue this career simply becasue they do not have money and time to pursue pharmacist studies, you should never say this in an interview. Of course you may consider this job as your first career step, and study pharmacy distantly while working as a pharmacy technician. That is a good answer. Another alternative is to focus on your understanding for the role, the meaningful purpose you see in the job. You can also say that you really enjoy the pharmacy environment, and the nature of the job. Point out the good things, be honest, but do not necessarily show all your cards. Therefore they do not expect you to be overly excited about the job, or anything like that. But they expect you to really want the job–at least in this stage of your career. Show them a clear reason why you want it, and they will be happy with your answer. 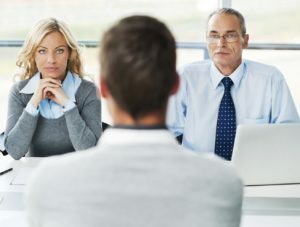 Once again, the real reasons for our choice, and the reasons we should refer to in a job interview, differ. Typically we want to work close to our house, so we don’t spend two hours a day driving to work and back home… Simple as that. Or we will choose a pharmacy that offers $1 per hour more than the other one. Or we will simply apply for many offers, and hope for the best :). Nevertheless, this is not a way to go in your interview. You should find something–at least something, that differentiates the pharmacy from their competitors. What can it be? Perhaps it goes about a strong brand (retail chain) that offers a wide range of products to clients, and a great job security for all their employees. Perhaps the pharmacy has an excellent location, and offers special discounts to patients. Anyway, you should look for something, and refer to it as your reason for choosing them. There is nothing wrong with being ambitious. You can say that you want to study, but you should ensure them that your studies won’t prevent you from going to work, and taking care of your duties while n shift. You can say that you are happy with this position and the benefits it offers, and do not plan to study pharmacy, or look for any other occupation in the near future. One way or another, the key is to show them that they can count with you in a long run, that you do not plan to look for some other job in a few months time. You should show some self-confidence. Unless you believe that you can do a good job as a pharmacy technician, they have no reason to believe it either. Talk about your communication skills, sense for responsibility, and teamwork ability. You can also refer to your listening skills, discipline, and perfect understanding of the job, and of your working duties. Show them that you have what it takes to be a great PT. Talk about the strengths that matter for this job. 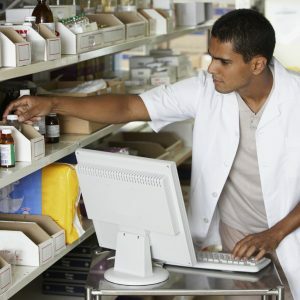 Do you think that pharmacy technicians should get a certification? Why do you think so? How would you former colleagues (schoolmates) describe you? Behavioral questions refer to various situations that happen daily in a pharmacy. You will experience pressure, joy, but also disappointment. You will have to deal with conflicts, and sometimes the pharmacists you will work with won’t be in a good mood. Job of a pharmacy technician is not a walk in a park. While it offers many benefits, and it is better than most jobs that pay the same amount of money, it has also some drawbacks. 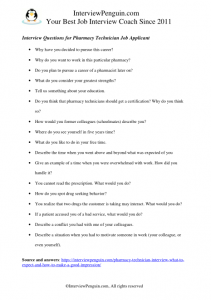 Your answers to behavioral questions help the pharmacy manager (or anyone else who leads an interview with you) to understand your attitude to difficult situations. Let’s have a look at some of these questions. Note: The following text is from an eBook called Pharmacist Interview Guide, written by Anita Stosur. Check the eBook for more questions and answers. Pharmaceutics is a competitive business. Each retail store operates a pharmacy nowadays, we have big retail chains, pharmacies in hospitals, and many other, independent players on the market. If you have no previous experience with going above and beyond in work, try to speak about similar situations from the college, or even from your family life. All you have to do is to talk about the situation when you did something extraordinary for another human being. Your attitude matters the most, not the particular situation you pick for your answer. Work of a pharmacy technician can be pretty demanding, especially if you work in a busy retail store. Interviewers know that an ability to plan your work, and to prioritize the working duties correctly, can pay big time when the schedule is busy, and people tired. Try to show them that you can handle the pressure, describing a situation when you successfully overcame difficult feelings and emotions in job. If it is your first job application, you can speak about college times, internship, or about any other busy period of your life. One way or another, your story should have a happy ending, meaning that you handled the heavy workload. Do you try to solve the problem, or do you call the physician immediately? Do you have a system of steps to take when you ca not read the prescription? And do you care at all? Like many other times in an interview, we test your attitude to the job and to the patients. You should try to convince us that you would never dispense any drugs unless 100% sure about the prescription. Calling the physician should be your last option, but it should be on the list. You can of course start with saying that you’ll consult other staff members to help you with reading the prescription. How do you spot drug seeking behavior? You realize that two drugs the customer is taking may interact. What would you do? Describe a situation when you had to motivate someone in work (your colleague, or even yourself). The demand for pharmacy technicians is growing, but it doesn’t necessarily means that your interview will be easy. You may still compete with 3-5 other people for the job, especially if you apply for a position in a pharmacy that pays slightly better than their competitors. Success in this interview is not a question of luck, however. The one who prepares well for this meeting, the one who is ready to answer both personal and behavioral questions, the one who makes a good impression and demonstrates their readiness for the job, is typically the one who succeeds. If you are not sure how to answer the questions, consider having a look at an eBook from Anita Stosur, the Pharmacist Interview Guide (it applies perfectly to pharmacy technician interview as well). Alternatively you can continue your preparation with us, practicing your interview answers, or reading one of the other articles.